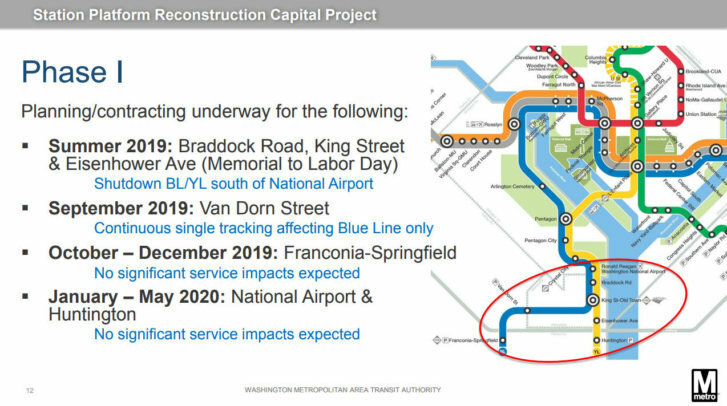 WASHINGTON — Metro plans to temporarily close all Blue and Yellow line stations south of Reagan National Airport next summer as part of a massive construction project to rebuild 20 outdoor station platforms over the next three years. Metro announced the planned station closures Monday. The transit agency said the closures are necessary to repair structural deficiencies in outdoor station platforms that are exposed to the elements. The project is expected to cost between $300 million to $400 million and is the first major construction project since D.C., Virginia and Maryland approved dedicated funding for the transit agency. The construction project is likely to trigger the biggest — and perhaps most painful — impact to Metro riders since the 2016 “SafeTrack” surges, which involved trains sharing a single track for weeks at a time and partial shutdowns on some sections of track. During the first phase of construction, which coincides with the summer shutdown, Metro plans to demolish and rebuild station platforms at Braddock Road, King Street and Eisenhower stations. Metro said it work with local jurisdictions to come up with “customer travel alternatives” for riders. During the shutdown, Blue and Yellow Line service will continue to run but only between the airport and Largo Town Center on the Blue Line and between the airport and Fort Totten/Mt. Vernon Square on the Yellow Line, according to Metro’s plans. Following the initial summer shutdown, Metro plans to rebuild platforms at the airport station as well as at Van Dorn Street, Franconia-Springfield and Huntington between September 2019 and May 2020. However, those stations will remain open during construction, Metro said. During work on the Van Dorn Street Station in September 2019, Metro expects continuous single-tracking to be in effect on the Blue Line only, according to planning documents that will be presented to a Metro board of directors committee on Thursday. Another 13 station platforms are slated for rebuilding but not until 2020 or 2021. They are: West Hyattsville, College Park, Greenbelt, Rhode Island Avenue, Vienna, Dunn Loring, West Falls Church, East Falls Church, Cheverly, Landover, New Carrollton, Addison Road and Arlington Cemetery. Metro did not say how service would be affected at those stations. The agency is still developing plans, it said. In a statement, Metro said it settled on the shutdown approach after “extensive internal planning and consultation with construction contractors” and aims to minimize the impact on riders. Keeping stations open and navigating trains around the work zones would likely have resulted in years of single-tracking delays, Metro said. Overall, the Metro system has 45 outdoor platforms and 10 of them have already been rebuilt. The last stations with rebuilt platforms were the Minnesota Avenue and Deanwood stations on the Orange Line. Working on only night and weekends, that took about three years to complete, Metro said. Repairing 20 station platforms using that approach would take 30 years to complete, according to the planning documents.